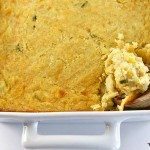 Southern Cornbread Dressing makes a comforting, classic dish for the holidays! 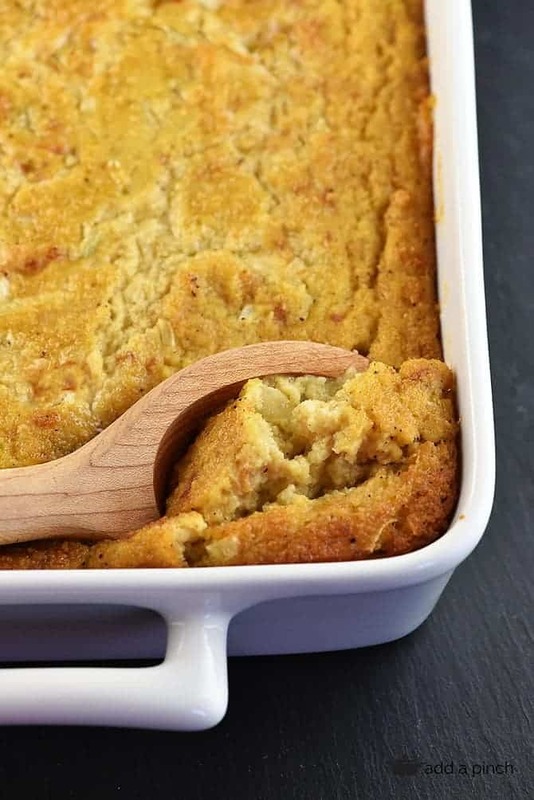 Moist and delicious, cornbread dressing makes the perfect side dish! 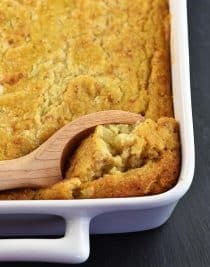 Cornbread dressing could easily take center stage at my family’s table during the holidays, especially at Thanksgiving. On that special day, the cornbread dressing really rivals the turkey for attention. No stuffing in this house, and no funny stuff in our dressing. I think I’d no longer be allowed to make it for my family if I “messed” with this traditional family recipe. But you know, every family makes their recipes a little bit differently, and that’s what makes family recipes so special, I think! The special touches to suit your family’s taste preferences lets you know that those recipes were made with tons of love and care for each person who would gather at the table to enjoy them. For our dressing, we use my Grandmother Verdie’s recipe that she got from her own mother. It starts with a skillet of my southern buttermilk cornbread. You can prepare it the day ahead and cover tightly, if you’d like. Likewise, we use leftover biscuits from the day before, but you can also use sliced white bread like my Grandmother showed me one day when Granddaddy had grabbed the last couple of biscuits she’d stashed away for her dressing as a “snack.” The bread works perfectly, too! Crumble up your cornbread in a large bowl. Go ahead and use the largest bowl you have. You’ll want to really mix this up well. If you don’t have a really large bowl, grab a stockpot. It works perfectly for when you need to mix large amounts but don’t have a bowl big enough! Now, you’ll crumble your leftover biscuits or bread into the cornbread crumbles. This is a good thing to get the kids to help you do. 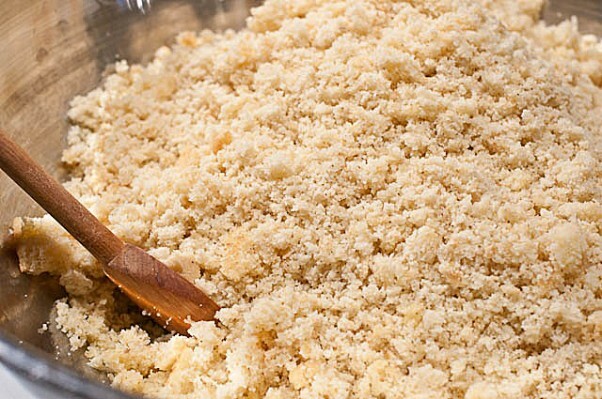 Making crumbles was always one of my favorite things to do to help for Thanksgiving. That and taste testing! Ha. For the cream of chicken soup, I prefer to use my homemade recipe. If you’d rather use canned cream of chicken soup, by all means it works great as well. Another tip is to make sure you use plenty of Chicken stock when you make your dressing. It makes for the most moist and tender dressing. If you don’t use enough, you’ll have dry dressing and nobody likes dry dressing. Well, at least no one that I know, anyway! This recipe yields two 9×13 dishes of cornbread dressing and you may think that sounds like way too much dressing. But, since my sister doesn’t care for onions, I always make one pan with and one without the onions. Here’s the recipe for my family’s Southern Cornbread Dressing. I sure hope you love it as much as we do. We always like to finish it off with a drizzle of giblet gravy. 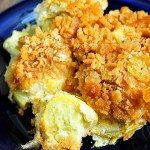 Cornbread Dressing is a classic southern dish served especially during the holiday season. 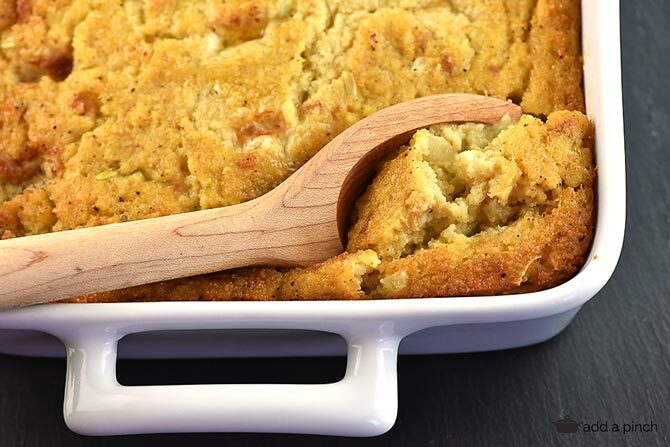 Moist and delicious, cornbread dressing makes the perfect side dish! Crumble all of the cornbread and biscuits (or white bread slices) into a large bowl. Add salt, pepper, eggs, onion, celery, butter, cream of chicken soup, and chicken stock. Stir until well-combined. Pour dressing into two 9x13 baking dishes and bake until lightly browned, about 30 - 45 minutes. To test doneness, shake casserole dish lightly. If the center of the dressing moves, then the dressing is not cooked through in the center. Continue to bake until the dressing is set throughout. You can pour dressing into two smaller casserole dishes to reduce cooking time to about 35 minutes. I like to do this for one pan with onions and the other without for those who do not like onions. – Make cornbread for your dressing the day before. Wrap it up tightly until ready to mix your dressing. – Mix up all of your dressing up to two days ahead of the big day. Wrap it up tightly and place in your refrigerator. – Freezer-Friendly – prepare without baking up to two weeks in advance, wrap tightly and freeze. Thaw in refrigerator two days in advance and bake on Thanksgiving Day. – Bake your dressing early in the morning and then place in the refrigerator. While your turkey is resting, place your dressing back in the oven to thoroughly reheat. Am about to make your cornbread dressing – made Grandma Verdie’s cornbread and chicken stock yesterday. Will be making your homemade cream of chicken soup shortly. Am so excited to use your recipes for today. However, as I am reading the dressing recipe, I see it calls for 1/2 cup of butter, but I don’t see where/how to use it in the recipe directions. Is it just for melting to put in the 9×13 pans for cooking. I am hoping like hick you are not knee deep in cooking this morning and are able to receive this and post back your answer here post haste. Regardless, am wishing you and your family a very Happy Thanksgiving. I am thankful I found all of these recipes (all 4) for our Thanksgiving Dinner. Robyn, never mind. I discovered in copying your recipe down by hand, I inadvertently failed to include butter in the list of ingredients to combine into the dressing. So, the problem was not in your recipe but in my haste to write it down. Sorry to have bothered you with this. Happy Thanksgiving! When ur preparing it and everything mixed together is it supposed to be real liquidity? And also I crumbled the cornbread and biscuits kind of fine is that ok? Or should that have been bigger pieces? Yes Jennifer it sounds like you did it just fine. Love the recipe- it is in the oven now. Can’t wait to taste it. Thanks for posting. I hope you all love it, Sue! I am making this recipe for the first time and I’ve added everything and put in 4 cups of chicken stock and the mixture is already very soupy.. do I continue with adding the other 2 cups?? Is it supposed to be really runny before baking it??? Yes, it is a very loose mixture before baking. My mother in law showed me how to make dressing and she baked the onions and celery into the cornbread. This makes sure the vegetables are done and not crunchy. I made my dressing mix last night with eggs and everything and immediately put into the refrigerator and put it into the oven about 12:00 this afternoon. Is it safe to eat?? I’m so confused after I read your tips to make thanksgiving dinner it says I could make it up to two days. But now I’m scared with what others are saying? It smells so good. I haven’t ate it yet . But now I’m scared. Yes, if you refrigerated your dressing mixture before baking immediately, it should be just fine to bake and eat today. I hope you enjoy it! Super excited to taste this! I have it in the oven right now 🙂 The only alteration I made was adding some shredded chicken (not too much) into the mix. I like dressings that have shredded meat so wanted to add that element into this recipe. Happy Thanksgiving and thank you for sharing this! Hi! Can I just cut the recipe in half if I only need one 9×13 pan? 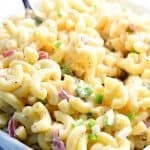 Only cooking for 4, but would love to try this recipe! I know sometimes cutting recipes in half can backfire, so just wondered if you’d tried it. Thanks! You can cut it in half, but I’d use two eggs. Thanks Heather! My mother passed away a year ago this month. Sad to say, I didn’t have her recipe. I searched the Internet and found great reviews on your cornbread dressing. I boiled a chicken, deluted 3 bullion cubes, adding to the water. My husband can’t stop talking about how delicious my dressing turned out. I normally don’t leave reviews, but I made this for Thanksgiving and it was perfect. I grew up in South Georgia, and this dressing tasted just like the best I’ve had growing up (minus some of the salt). I made the cornbread and cream of chicken soup that were linked in the recipe as well, which I did the night before to help on Thanksgiving Day. I did end up adding some more salt, and mine still looked a little pale after 45min, so I ended up cooking it for closer to an hour. If you made this by the recipe and it was too soupy, it sounds like it needed to cook a bit longer. My family has made it for at least three generations and it is always delicious. Just bake it a bit longer if it needs it. Thanks! I made your cornbread dressing for our Thanksgiving dinner yesterday and it tasted great but I have some questions about the texture. First, a little history. 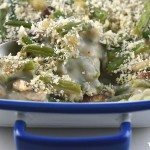 I have been searching for a cornbread dressing recipe like my grandmother’s that would have all the correct measurements (because my grandmother never wrote her recipe down and we have been trying to get it right since she died several years ago). I thought yours might be the solution because your Southern Cornbread recipe is just like ours with the only difference being that we use Lamb’s Stone Ground Course cornmeal and not fine (yay for REAL cornbread and not that sweet, cake like northern stuff). Also, your dressing recipe was very similar to ours with the exception of the Cream of Chicken soup and white bread/biscuit addition (we use a bag of Pepperidge Farm Herb dressing mix and no soup). My question is if your dressing is supposed to be fairly mushy inside after cooking, almost the consistency of cooked oatmeal? We are used to a firmer dressing (but not dry). I used 2 cans of soup (10 oz each) for the 4 cups the recipe calls for because I assumed you meant 4 cups of your homemade soup which you explained you used in a ration of 2 cups homemade to 1 can store bought. Should I have used less liquid to get the correct consistency? I am so glad to have found your site because so many of the recipes remind me of foods my grandmother used to cook. I look forward to trying many more! Yes, it sounds like it turned out as it should have. My dressing is really moist – not a firm or dry dressing. I’m so glad found my site too and hope you enjoy the recipes! Thanks! So I followed the recipe and it turned out Great! Everybody LOVED IT!! P.S. Yesterday was my first time EVER making cornbread dressing… Thank You Sooo Much For Sharing Your Recipe…YOU ROCK!!!! Do you need to grease the pan before putting the mixture in it? I am just making this today. I don’t have eggs or baking soda. I am trying mayo in the cornbread. Do I need to grease the pan? I don’t think so. This recipe is amazing!!! 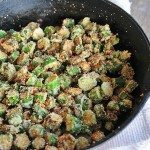 I have been looking for a cornbread stuffing recipe, that was similar to my Great Grandmother’s. I made it for Thanksgiving last week, and everyone loved it, including ME!!! Will keep this recipe forever. Thank you so much!!!! I’m so glad you enjoyed it, Ebonee! Thanks! MAN, I’m SO grateful for this recipe! It helped me make my first Thanksgiving meal a charm! This dressing was definitely the highlight of my dinner! It tasted just like my late Grandmother’s dressing!!!! My late sister-in-law always had a pan of juice she got from boiling the gibblets. She put her chopped up eggs into this juice. Have you ever heard of this? I reduced the chicken stock quite a bit and it was sill too moist. There is a particular texture that I am trying to achieve and was not able to. I don’t see how you get all of that in a 13X9″ pan. The flavor was great tho. Open to suggestions. I am glad you enjoyed the flavor! It’s been one of our family favorites and a tradition for many, many years. The dressing is a bit moist, but if it is still not set and still “jiggles” when you check it for doneness, it may need to cook a bit longer. I’m not sure what texture you are going for as you mention. The recipe calls for TWO 9×13 pans, not one. It would be a bit tough to fit it all into one of those pans as it makes enough for two of them like I mention in the recipe. As far as suggestions go, I can just say that the recipe has been in my family for generations, made exactly according to this recipe. Check to make sure it’s done as I mentioned. I hope this helps. Thanks! After searching and searching, I’ve found my recipe. It was delish. I’m glad you enjoyed it, Angel! Thanks! Do you boil the eggs and celery before putting them in? If not is the celery done enough? You don’t cook the eggs or celery before adding. Yes, they are done when following these directions. Hope you enjoy it Jessica! Thanks! I’m using canned cream of chicken soup, does the soup need to be cooked prior to adding it to the mixture? If so, being that it’s condensed soup, do I cook the soup as directed or just heat it up as it is? Do not cook the soup prior to mixing it in the dressing recipe, Terri. Enjoy! Is 1 full recipe 1 skillet of cornbread? Your recipe will make 2-13×9” pans of dressing with just 1 skillet of cornbread which be more than enough but If I add a skillet of cornbread, would I need to double everything? Hi! I’m using canned cream of chicken soup although I intend to learn to make your recipe eventually. What is the equivalency between your soup and canned soup? Also, use it condensed or mixed with water before using? Can you make this without the eggs? I have a family member with a egg allergy. Thank you. Is there a video of how to cook this recipe? No. I’m sorry! We haven’t made a video of this recipe yet! So excited, this sounds just like what I grew up with! Only I use more sage, love that herb!! In the oven, smelling yummy!! Merry Christmas to you and yours! I’m making your dressing for the first time. The way I learned about cornbread dressing we didn’t use cream of chicken soup. So will using chicken broth be enough? Or do I need to add the soup? Thanks for sharing your recipe. 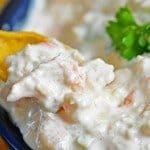 Really good recipe I made a few changes because the recipe looked a bit ‘soupy’ and I like the cream of celery cream of chicken flavor combination better than just cream of chicken. 2 large eggs; 1 can (10.5oz) condensed cream of chicken soup; 1 can (10.5oz) condensed cream of celery soup; 1 cans (14.5 oz) chicken stock; 1/2 pound of cooked pork sausage (Louisiana thing); 2 large hard boiled eggs (Louisiana thing). My search for a homemade dressing recipe is over! I wanted a recipe with homemade ingredients. I followed everything and was nervous about it being to soupy but it came out perfect. I only added shredded chicken. My family loved it! I made dressing for the first time in my life and I am 60, using your recipe, of course. I was delicious!! Made one without onion for my husband. I did cook it around 20 minutes longer to get a firmer dressing. I do have one question. I used the canned cream of chicken soup straight from can. I did not cook it. Is that correct? I got to thinking, was I to cook the soup and then measure 4 cups or just measure it in solid can form. Thank you for making my first try a success!